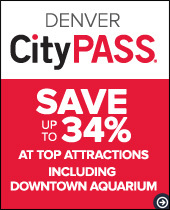 Downtown Aquarium was purchased by Landry's Restaurants, Inc. in 2003, when it was Colorado's Ocean Journey Aquarium. On July 14, 2005, Landry's reopened the redesigned complex as Downtown Aquarium. The entertainment and dining complex features a public aquarium boasting more than a million gallons of underwater exhibits that highlight fascinating ecosystems around the world. Downtown Aquarium houses over 500 species of animals, the interactive Stingray Reef touch tank, Aquarium Restaurant, Dive Lounge, the Nautilus Ballroom and amusements for the entire family. With a full-service restaurant, an upscale bar, a fully equipped ballroom, aquatic & geographic exhibits and shopping, Downtown Aquarium has it all! Sunday – Thursday: 10:00 a.m. - 6:00 p.m.
Friday – Saturday: 10:00 a.m. - 8:00 p.m.
From I-25 traveling north: Exit 23rd Avenue (Exit 211). Follow the exit to the right (you will now be heading east), where you will immediately see the Aquarium on your right. From I-25 Southbound: Exit 23rd Avenue (Exit 211). Turn left at the stop sign (you will now be heading east), and you will see the Aquarium on your right just after your cross over I-25. Go west on 15th Street to Platte Street. Turn left at Platte and continue past the REI Building. Platte Street will turn into Water Street. You will see the Aquarium on the left side of the street. Magic Memories Team to help you retrieve it! *Includes: One 4-D Experience, and your choice of two: Stingray Fish Food, Face Paint, Small Soda, or Coconut Tree Climb. Sharkey Fun Zone may be closed at certain times for birthday parties. Please call in advance to check availability. Exhibit Discount and Free Parking after 6pm with Aquarium Restaurant receipt! 10% military discount available on exhibit tickets, retail and Aquarium Restaurant with a valid active military ID or VA ID Card. Valid for up to four tickets. Military discounts also available at local military bases. Must show valid military ID or VA ID Card when purchasing. Please visit the ticket booth for more details.